This thread is our first listener request by our friends over at the WDW Park Hopper podcast. Their request? Splash Mountain. My wife and I recorded this memory thread on May 21, 2015, during a 10 hour visit to Walt Disney World’s Magic Kingdom. I had been sent to Tampa for work and we took this rare opportunity of being sent down to central Florida to take a little time for ourselves as a delayed 15th anniversary present to ourselves. We arrived at the Magic Kingdom around 1:00pm. As soon as we stepped out of our car and started walking towards the parking lot tram, an enormous crack of rolling thunder signaled the beginning of a fierce, but short rainstorm. Luckily, by the time we walked off the “Admiral Joe Fowler” after crossing the Seven Seas Lagoon, the rain had completely stopped. It stayed clear, but very hot during the rest of our time in the park. Crowds were predicted to be a level 5, but were actually a level 6, but they were a whole lot better than the level 10+ we experienced during our visit back at the end of March. After entering the Magic Kingdom, we wandered around a bit, looking for things to do before our Fastpass time for Splash Mountain came around. Maybe someday I’ll post the memory thread of our wanderings for you to listen to. We went to Splash Mountain, made our way through the queue and got seated in the last row of seats in our boat.This made for a nice ride and we didn’t get wet from the final drop, unlike the people sitting in the front of the boat. 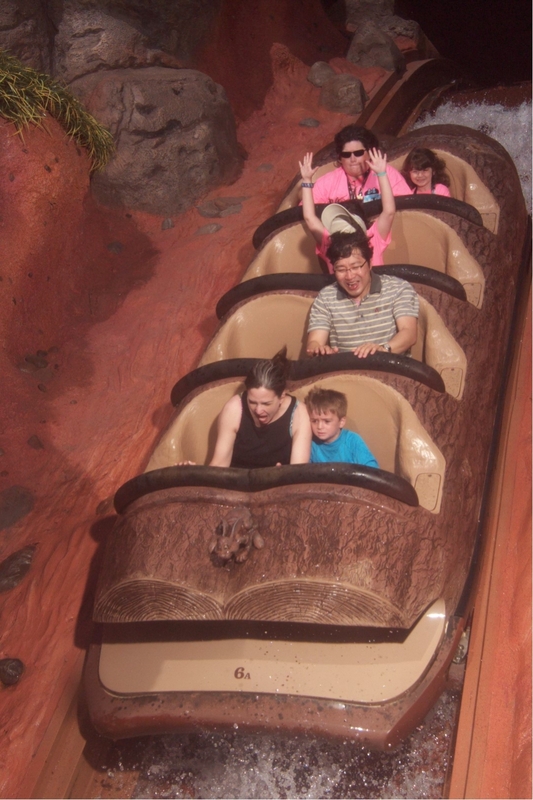 Splash Mountain is a log flume-style dark ride at Disneyland, Tokyo Disneyland, and the Magic Kingdom at the Walt Disney World Resort, based on the characters, stories, and songs from the 1946 Disney film Song of the South. The plot behind Splash Mountain is a composite of several Uncle Remus stories featuring scenes taken from the animated segments of Song of the South, telling the story of Br’er Rabbit, a mischievous rabbit who leaves his home in search of adventure. The idea for Splash Mountain was originally conceived in the summer of 1983 by Imagineer Tony Baxter while stuck in rush hour traffic on his way to work. At the time it was built, Splash Mountain was one of the most expensive projects created by Walt Disney Imagineering at a cost of $75 million. Baxter and his team developed the concept of Zip-a-Dee River Run, which would incorporate scenes from Song of the South. The name was later changed to Splash Mountain after then-CEO Michael Eisner‘s mostly-ignored suggestion that the attraction be used to help market the film Splash. Splash Mountain is located in Frontierland, across the way from Big Thunder Mountain Railroad. Riders board eight-passenger logs, seated two by two. The log departs the loading area, where Br’er Frog provides introductory narration. The log ascends a dual-chain lift that deposits riders in a small pond at the bottom of the big drop. After a right turn, logs enter the barn and climb another lift to the space behind the visible mountain, before floating gently through scenery designed to evoke the feeling of a river in the Southern United States, particularly Georgia, where Song of the South was based. The homes of the three main characters, aged farm equipment, stagecoach wagons, and ale barrels are incorporated into the landscape, along with a country instrumental version of “How Do You Do?” emanating from hidden speakers along the waterway. After passing Br’er Bear’s cave, the logs descend down the Slippin’ Falls drop and cross back under the flume. The logs then enter the indoor portion of the attraction, where various Audio-Animatronic animals including geese and frogs sing the attraction’s first musical number, “How Do You Do?”. Several vignettes establish the story of a restless Br’er Rabbit leaving home and being pursued by Br’er Fox and Br’er Bear. Br’er Fox and Br’er Bear see Br’er Rabbit telling Mr. Bluebird that he’s going to his Laughing Place. Br’er Porqupine warns him of the danger ahead, but Br’er Rabbit continues on. “Everybody’s Got a Laughing Place” begins to play after Br’er Bear springs Br’er Fox’s rabbit trap. The logs continue onward past a roadrunner who asks to be taken along to the Laughin’ Place, while opossums sing the song from overhead. The logs reach a dark tunnel followed by a “dip-drop” into the Laughin’ Place. Bees attack Br’er Bear while Br’er Rabbit laughs with joy, unaware that Br’er Fox is behind him, preparing to drop a beehive on top of him. The logs then go over another short drop, and head further into the cavern scenes. There, geyser-riding turtles, singing bullfrogs, and dancing water fountains guide the log to a dark area in which Br’er Rabbit has been caught by Br’er Fox in a cave of stalactites and stalagmites. Two vultures wearing top hats taunt riders as they begin their ascent up the final lift. A scene to the left side of the flume shows Br’er Fox menacing Br’er Rabbit, with Bre’r Rabbit pleading not to be thrown into the briar patch. At the top of this third lift hill, the log descends the 50-foot drop at a 47 degree angle, reaching a maximum speed of 40 mph and the on-ride camera snaps a picture. After another outdoor flume segment, the log coasts back into the mountain, where critters at “Doo Dah Landing” are singing “Zip-A-Dee-Doo-Dah” in celebration of Br’er Rabbit’s return, while Br’er Fox and Br’er Bear attempt to fend off Br’er Gator. At the end, Br’er Rabbit sings with Mr. Bluebird, telling guests that he learned his lesson. After exiting the log, riders may purchase a picture of their log falling at the final drop. I really appreciate you taking time out to listen and share my family’s Walt Disney World memories. If you like this podcast, could you do me a few favors? Please like us on Facebook, we’re at facebook.com slash wdwpensieve, and subscribe to the podcast on iTunes, Stitcher or YouTube. Also, help spread the word, tell your friends about the podcast, encourage them to give it a listen and maybe even subscribe. Please leave a review about the podcast on iTunes, Stitcher or YouTube. Leaving comments and reviews helps to increase the visibility of the podcast on these platforms, which could lead to more subscribers and increased circulation. And finally, if there’s a particular attraction you’d like to experience with us, please send an email to wdwpensieve@cableone.net. I have big news to share with all of you! I just recently acquired the domain of www.wdwpensieve.com along with hosting services. In the very near future, I’ll be moving this podcast from our current provider at Podomatic to the new site. In the process of the move, because I can’t edit the rss feed myself, I’m going to have to change the address of the feed in iTunes and elsewhere. For those of you who subscribe to this podcast, that means I’ll lose you as subscribers, but hope you’ll follow me to the new site and subscribe again. I’ll post a short podcast informing of the date of the changeover to give you plenty of notice. Well, that will do it for memory thread number 6 in the WDW Pensieve. Once again, I appreciate you sharing our memories with us. Thanks for listening and we’ll see y’all real soon!